The Salford Militia Barracks was located on Eccles New Road, across from the Salford Union Work House. It was the headquarters of the 6th Lancashire Militia, a regiment formed in response to the Crimean War, which Britain entered on 28th March 1854. We assume that the barracks were built around 1855/56. There is a letter dated 19th December 1854, from Palmerston to the Earl of Sefton, affirming the plan to make Salford the headquarters of the 6th Lancashire Militia. 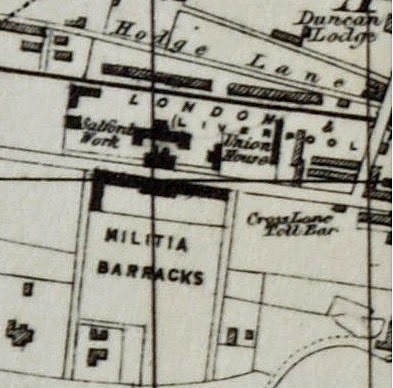 The militia barracks appears on Micklem's 1857 map shown above. 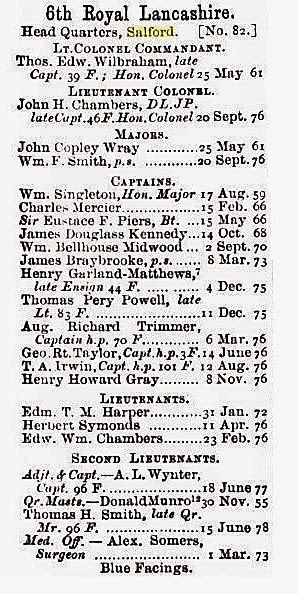 In December 1854, Thomas Edward Wilbraham  was appointed Lieutenant Colonel of the 6th Lancashire Militia Regiment. However, the regiment was not embodied until 17 May 1855, and while it had been agreed that Salford would be its headquarter, the regiment was first sent to Ashton on 2 July 1855. Presumably this was because the barracks at Salford had not been completed. The regiment was actually posted to Salford on 16 May 1856. However, with the signing of the Treaty of Paris on 30 March 1856, which ended the Crimean War, the 6th Lancashire Militia was disembodied at Salford on 27 May 1856. 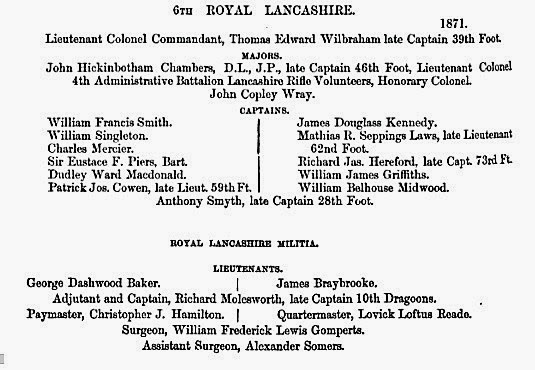 By 1859, the 6th Lancashire Regiment had been reformed. Staff Sergeants of the regiment had begun to drill the local volunteer rifle corps at the Salford Militia Barracks. In July 1860, a letter was received by Lieutenant Colonel John Henry Pringle, commanding the 6th Regiment, informing him that in future the 6th Lancashire Militia would be restyled as the 6th 'Royal' Lancashire Militia. By 1861, there were 71 people in the barracks. In July 1881, following the Childer's Reforms, the 6th Regiment, Royal Lancashire Militia became the 3rd (Reserve) and 4th (Extra Reserve) Battalions of the Manchester Regiment. In 1877, the 6th Royal Lancashire Militia at Salford was part of the 8th Army Corps (Edinburgh), Third Division, 2nd Brigade. By 1892, there was a proposal to purchase the site. 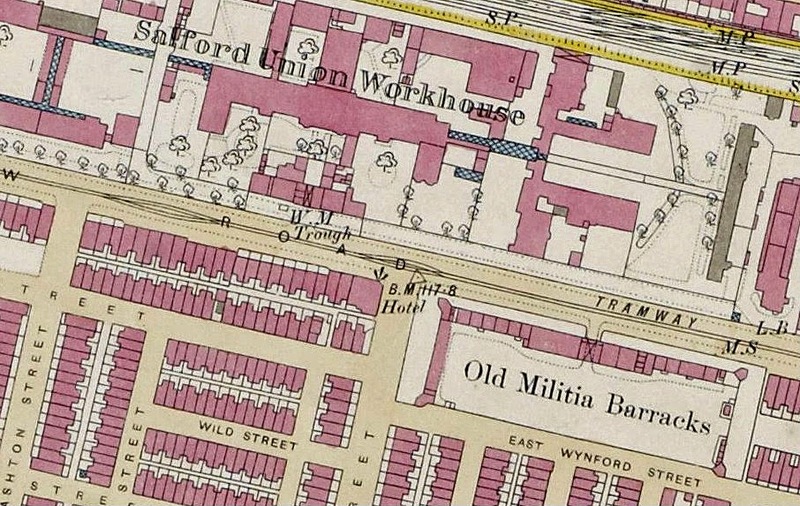 The Salford Militia Barracks appears on a map of Salford for 1896, but the installation appears to have been demolished around 1900. Its site had been converted to terraced housing by 1908.